Hallmark Hall of Fame will present “Sweet Nothing in My Ear” on CBS TV. It is scheduled to be aired first on Tuesday, April 1. This is the story of a deaf mother (Marlee Matlin), a hearing husband (Jeff Daniels) and their 8-year old deaf son (Noah Valencia) and their family struggle over trying to decide whether or not the son should have a Cochlear implant. The show is scheduled to be shown again on Sunday April 20, 2008. Check your local station for time and exact dates in your area. Suppose your deaf child could have an operation (not without risk) that might allow him or her to hear again. Dan Miller (Jeff Daniels) and his wife Laura (Marlee Matlin) only want what’s best for their happy and healthy eight-year-old son Adam (Noah Valencia), who’s been deaf since age four. Laura opposed the surgery – an implant. Being deaf, she doesn’t consider it a disability, and believes an operation, regardless of the outcome, would make Adam feel that something was wrong with him. However, Dan, who can hear, misses talking and listening to his son. For him, an operation is worth the risk, believing Adam’s life would be easier and more complete if he could here. Today's blog entry comes from a guest blogger! Amy, who began her school career as Ashley's one-on-one sign language assistant, has been promoted to a classroom instructional assistant. She is assigned to what my school district reprehensibly refers to as the 'severe and profound' classroom. 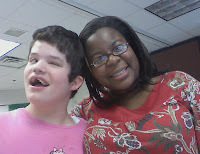 In today's guest blog, Amy shares a story about discrimination for students with disabilities. Go Amy!! Fishing lessons in P.E.? Our school teaches a long series to the seventh and eighth grade students on how to assemble your gear, cast, and reel. At the end of this lesson each class goes to a local park to practice their learned skills by fishing in the pond. This year, all three of the special education classes were invited to go on the trip. I’ll be honest. At first I thought this was a joke. I didn’t have a clue how my students would handle a 45 minute trip to the park to fish. They were not taught anything about fishing, so how would they know what to do? Closer to the trip date, I realized that both of the classes with students who had less severe disabilities were given the permission slips to take home, however, my “severe and profound” class had been left out of that process. Of course I felt as if my students were being left out because to their disabilities. Rather quickly after I began to ask questions about my students not receiving the permission slips, they were in my hand. I was so excited that we were doing this trip with all students included and working together. The excitement wouldn’t last long as I started to think about the little details that no one had probably thought about. Was their a handicap accessible bus going on the trip? Would the hourly instructional assistants come in early that day to accompany their students on the trip? Yet again I had to ask these questions and receive all of the puzzled looks as a response as if I were speaking a foreign language. Later that day I had solved the bus situation for them. It was all pretty simple to me. The student that has a wheelchair would not be at school that day, and the student that is required to wear a safety harness (a special type of seat belt) could have the strap taken off of the accessible bus and hooked into a seat on the general education bus. I thought all issues were solved and we explained to the students where we were going and what we would be doing the next day. I received a call the night before the trip from the instructional assistant to the student that wears the harness. She had been told as she was walking out the door the day before the trip that her student would no longer be permitted to go on the trip. Transportation seemed to have no clue how to make the accommodations needed for this student. This student’s instructional assistant is very dedicated to her student and very interested in allowing him every opportunity to learn, so understandably she was extremely upset by this news. I told her to not worry and to still plan to go on the trip. Before I signed in the next morning, I began to ask questions to the administration. I knew that what they were doing would be breaking the law. The student had been asked to go, given permission from his parents and then denied the right to go based on his disability. D-I-S-C-R-I-M-I-N-A-T-I-O-N!!! I made sure to explain the details and remain calm. I spoke in detail to administration about equal opportunities. While still working on administration, I had one of the hourly aides take a strap off of the handicap bus, still hoping to make the school realize that if they denied the trip for this student, they were breaking the law. I know a great lawyer that works for the states protection and advocacy office. Finally, I had convinced everyone that the student had the right to go. I had not only saved the school from a law suit, but opened the eyes of many people. I fought for this student’s rights; I felt that I had done my job. I made difference for many people in the future, at least at this school. Well, Thursday didn't turn out quite as I had planned. I have had a really bad cold for a couple of weeks, and yesterday decided to go to the doctor. Instead of just having a bad cold, I have a sinus infection, and am feeling like something my cat killed and left on the porch :( But, I do want to post my Thankful Thursday list as usual. I find it helps me keep the rest of my week in perspective. for the new mulch that my two sons did such a great job spreading in all my flower beds and gardens. Now I am anxious to plant flowers! for yellow Converse tennis shoes with white polka dots - Ashley's birthday present! Do you think parenting a child with a disability has changed you? Small changes or big changes? After I wrote my blog entry on my trip to the virtual future, I started wondering if that future would look completely different had I not been raising children with disabilities. And, I most definitely think it would. I would be less patient. I would not be as assertive. I would still be very uncomfortable speaking in front of people, yet now I really enjoy sharing my story with people. I don’t believe I would find enjoyment in the smallest of things this world has to offer – real enjoyment, I mean – where I would take the time to notice every detail of the hummingbird in my back yard, for example. I would think “Oh, a hummingbird, and then turn my attention to something else. In fact, now I seek out the details and the beauty that can be found all around me. Ashley has taught me that. I would still be voting as a Republican where now my commitment is to the Democratic Party. I would probably be uncomfortable with people of different abilities and not able to see the worth of everyone that didn’t fit the same mold from which I was raised. I might be one of the parents I see and hear in my children’s schools who don’t understand why a child with different abilities needs to be in “my” child’s regular education setting. I might believe that my life was good never knowing how much better it actually could be. I wouldn’t understand that people can communicate without ever saying a word. I might not celebrate my child’s smallest achievements expecting even more and only celebrating the biggest ones. I would have time to exercise and take care of myself, and I might have been able to take the gourmet cooking class I wanted to take. I definitely wouldn’t know that camellias and pansies are edible and what they taste like. I probably would never have heard of a nebulizer or a G-tube. I would sleep at night – all night – without getting up to see if my children were still breathing. And, I would never have met the hundreds of very special adults and children that I now consider my friends. Yes, my life might have been easier. I might not have been as stressed or tired as I seem to almost always be these days. My life would, however, be like eating no-fat frozen vanilla yogurt instead of the Ben and Jerry’s Chubby Hubby that I so enjoy. I am grateful for every second of my life and everything good or not so good that it brings. I like the person I am today, and I’m not sure I could have said that had I not been the parent I am with the children I have. 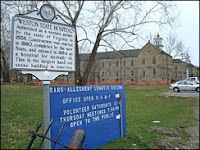 Recently an old hospital, Weston State Hospital in West Virginia, was sold at auction to new owners who have named it the Trans-Allegheny Lunatic Asylum. Weston State was a mental institution, and the new owners have events planned for after they refurbish such as “Psycho Path” dirt bike races, "Hospital of Horrors" haunting tours in October, and a "Nightmare Before Christmas" tour on Dec. 23. Does this bother others as much as it bothers me? Last week, I took a trip into my family’s virtual future. Today, I’m going to go 10 years back into Ashley’s life – back to the time when she was 3 years old – for a glimpse into the past and an understanding of how incredible it is that she has become the vibrant, intelligent child she is today. Ashley has been with me for one year now, and what a year it has been. She had spent her first two years with a foster mother, a woman who met her while she was in the hospital. Ashley was born 14 weeks prematurely. She spent 4 months after her birth in the hospital, and Linda, the foster mom, visited her almost every day. When Ashley was well enough to leave the hospital, she joined Linda and the daycare children that Linda watched on weekdays at Linda’s townhouse in the suburbs of Washington, D.C. I know very little about those two years, and that saddens me. I have a couple of pictures – one of Ashley on her first birthday, and one that appeared in the newspaper of Ashley screaming in Santa’s lap. Other than that, Linda shared with me the many illnesses that Ashley had endured, the brain surgeries, and the infrequent speech therapy that Ashley had. It’s easy for me to look back now and say I would have done things differently, such as more therapies, more early intervention services. But, those first two years are times I can’t change, but I am determined the change things now that Ashley is my daughter. On the day Chip and I drove to Washington to pick Ashley up and bring her to our home, before taking her home, I immediately took her to a neurology appointment. I had researched what doctors she would need, and then got recommendations from other parents as to which doctors they believed would be best for Ashley. So in the first few days with her new family, Ashley visited the neurologist, the pediatrician, the dermatologist, and the gastroenterologist. Her medications were checked and adjusted as necessary, and our life as a family of three began. The adjustments for everyone were many. Perhaps the most difficult one for me was figuring out how to cuddle and love this beautiful child who was so sensory defensive that she never wanted to be held. That was closely followed by my worries over Ashley’s lack of appetite and eating skills. She was still on a bottle and was taking only milk. Our days together turned into months, and an illness then changed everything. Ashley has significant issues with her ears. She had surgery in June on her ears, just three months after coming home to our family. That surgery further exasperated her eating problems, and she finally just refused to eat anything at all. After days of dealing with an NG tube (a tube placed through Ashley’s nose and into her stomach) to make sure she got the nutrition she needed, and after her weight dropped to an alarming 18 pounds, I made the decision to have a G-tube (tube surgically inserted directly into her stomach) placed for her feedings. Although the G-tube scared me greatly, it really was the best thing to do. By receiving the proper nutrition through the tube, Ashley began to grow and her health improved. She and I could now work on her feeding issues with the help of our local Children’s Hospital and not worry as much. And the tube helped get the proper amounts of her medications in – something that is very important because of her seizures. 1998 was ending on a high note, or so I thought at the time. Ashley was conquering her sensory defensiveness enough to the point that she would let me hold her – she was growing – she was more alert and open to the many therapists that came to our home – and her wonderfully quirky personality was beginning to shine. But then the unimaginable happened. Ashley had a seizure that came very close to claiming her life. Chip and I spent Christmas Eve 1998 sleeping in the waiting room outside the hospital’s intensive care ward. And, we would spend the next three months with Ashley in the hospital, praying every day that she would survive and come home with us. My birth son is now 27 years old. He graduated a while back from Virginia Commonwealth University with a degree in computer Information Systems and a minor in mass communication. A year after that, he graduated from Wharton with his MBA. After agonizing for almost year over where he would live with his beautiful wife, Rose, and my sweet little grandbaby, Elizabeth, they finally settled in the suburbs of Washington, D.C. Chip works for a newly formed satellite radio company that is exploring many unique and cutting-edge technologies for delivering radio content to people. He’s actually getting his hair cut on a regular basis now, but he still hasn’t given up his frayed bluejeans. PAVE program at our local community college, and received her certification as a nurse’s aide. This was a long term dream of Jessica’s, and I don’t think I have ever seen a bigger smile than the one on her face as she walked to get her certificate. She is living in a commune near the beach, and although it is reminiscent of the 1970’s to me, it is a lovely place where folks with disabilities as well as those without live peacefully together. There are always friends around to help Jessica if she needs something, and I believe the peaceful environment has really helped to keep her aggressive outbursts in check. She has her own little dog which just happens to look exactly like our dear Lizzie, who passed away seven years ago. Jessica and Fluffy, the dog, love to go for walks around the commune, and can spend many, many hours visiting with friends. Although she has come home for visits on several occasions, she prefers if I visit her there. I think she feels safe and at ease in her commune apartment, and something is telling her not to leave. I understand, and I am just happy that she is so happy. Corey is now 25 years old. After spending 4 years in high school in the JROTC, he decided to join the Marine Corp when he graduated. Even though he and I both thought boot camp was going to be his demise, he persevered and is today stationed in 29 Palms California. He is learning electronics, and I believe that will help him greatly if and when he decides to leave the service. Thankfully, the war in Iraq ended 8 years ago, and I didn’t have the worry of him going to war. He is now talking about applying to college, and I am encouraging him to do so. He also is married – to Lauren – and she is a wonderful young lady. Corey did a great job finding a good wife! They haven’t given me any grandchildren yet, but I think the time is nearing that they will. Ashley is going to be 23 years old soon. She’s been out of school for a couple of years now and is still trying to decide whether she prefers to work at our local greenhouse or as a tester for children’s computer software. While she has been making up her mind, she and I have been traveling the country in my hot little red convertible sports car (bought once the oldest kids left home and I no longer needed a van). We are making the rounds of the television talk shows to discuss the publication of my book, Blind Leading. Although it’s been out for a couple of years, it is still on the New York Times top 10 list, and we are still getting invitations to talk about it. Most of the shows would fly us to their locations, but Ash and I enjoy the car ride more. Ashley got a prosthetic eye almost 8 years ago, and I think she has finally stopped pulling it out to surprise people. Either that, or it’s no longer a surprise to everyone we know. She has redecorated her bedroom 6 times in the last 10 years, and is still requesting that we expand the size of her closet so she can fit in more dresses and Converse Hi-tops. I have a hard time refusing since Converse is using her in some of their shoe commercials. She has learned Braille and is an avid reader. She will sit in our family room after turning off all the lights and read for hours. I do have to keep reminding her that I need to lights to read though. Even though her first boyfriend, Miles, dumped her in 7th grade because she couldn’t stay up late enough to go to the 8th grade dance with him, he has realized the error of his ways, and 5 years ago, came back into her life. They are so cute sitting together on the couch while Ashley tries to teach him Braille also. I am finally not in pain all the time because a new medication was developed about 5 years ago for Lupus and Rheumatoid Arthritis. It has worked wonders in my life. Even though I am getting much older, I feel younger now than I did 10 years ago all because the pain is gone. And I LOVE my little red convertible!! Our life is good. Everyone is healthy and happy. Of course, since I am dreaming this 10-year-scenario, I wouldn’t have it any other way. What are your dreams for 10 years hence? for the very courteous and helpful employee at Target last weekend who just happened to have cerebral palsy. And I am thankful that Target hired him. for boys named Audin who like girls named Amy! when Amy sends me pictures of Ashley to my cell phone. They are my window to her world when I am not around. p.s. Happy Birthday, Mr. Rogers! I’m pretty familiar with the school referenced in the article, the Faison School. Many of my local school districts either choose to send or are forced to send (due process decisions) children with autism to Faison. The school itself has a good reputation, and is considered a good placement for children with some of the most significant behavior problems. Faison is private school that costs a great deal of money. Although their website points out that they are a 501-3C non-profit organization, and that they are part of a public/private partnership with our local university, the cost of attending Faison is quite large (10’s of thousands of dollars a year). With those costs, you can see why many parents challenge their school districts to provide placement at Faison at school district expense. No one, however, not school district or parents, can dispute that the school is good and that most of the students begin to finally make good academic progress. I wonder just what the heck “laboratory school” means and will the proposed residential community also be a “laboratory community”? Read the article and check out the school’s website and let me know what you think? I need advice. How have other parents taught their children with intellectual disabilities about the danger of strangers? Jessica, my now 17 year old daughter, is extremely social, outgoing and friendly. Those are for the most part very good qualities. However, she has yet to learn how to distinguish when she should be friendly towards someone and when she shouldn’t. Jessica has never met a stranger. Everyone she meets she treats like a long-lost friend – hugging, smiling, holding hands. If an abductor drove up next to her, said her name, and invited her to get in their car, she would do it. There would be no need for puppies, candy or any other item to lure her in. She would get in the stranger’s vehicle merely because the stranger smiled at her. I’ve tried, and Jessica’s teachers have tried over the years to explain dangerous situations to her. But it’s not working. Now that Jessica is 17 and will be 18 in just a few months, I am really starting to worry. Jessica has expressed the desire to live independently as an adult, and I really want to support her in that decision, but I am very worried. Not only will I worry about her getting in a stranger’s vehicle, if she lives independently I will worry about her letting a stranger into her apartment or entering a stranger’s home herself. Does anyone have any suggestions for teaching Jessica how to distinguish a safe situation from and unsafe one? For a quick snapshot into Jessica’s level of functioning, she has a moderately significant intellectual disability. She reads at a second grade level but without any real comprehension. She writes at a first grade level, and she does math at a 3rd grade level. She doesn’t handle criticism well, and she does have an explosive temper. Any and all suggestions would be much appreciated! I watched a miracle happen this weekend with Ashley – she ate several cheese quesadillas and 2 enchiladas. I know that doesn’t sound like much of a miracle, but believe me, it is. When I first brought Ashley home, she was two years old but was the size of a 9 month old. The only nourishment that went into her body was milk from a baby bottle. It wasn’t long after that homecoming that she was scheduled for G-tube surgery. The G-tube, once I overcame my initial and overwhelming fear of it, has proved to be a lifesaver for Ashley. She finally started to gain weight and grow once I was able to feed her through the tube. But, my dream for her was that she would be able to eat by mouth one day, and so, right after the tube was surgically inserted, Ashley entered the feeding program at our local children’s hospital. At this particular hospital, the feeding program involved me dropping Ashley off early in the morning on my way to work, and then she would spend the day with various therapists working on getting her to eat by mouth. At the end of my work day, I would pick her up from the hospital. For 5 days a week for 6 weeks, that was our routine. By the end of the six weeks, Ashley had stopped fighting the therapists and would sometimes agree to take a few bites of yogurt or pudding. We were still a long way from the dream of eating by mouth. At the end of the 6 week program, Ashley then transitioned to outpatient feeding therapy at a hospital location a little closer to home. We would go three evenings a week for the therapist to work very hard at getting a bite of a nutrigrain bar into Ash’s stomach. I was starting to get very discouraged and resigned to the fact that the G-tube might be the best solution for Ashley. It was at just that low point that a new therapist starting working with Ashley, and things changed for the better. The therapists at the hospital and for the first year at outpatient therapy used a behavioral approach to get children to eat. Ashley’s reluctance did not seem behavioral in nature. When the new therapist suggested that we use a sensory-based approach, I agreed, and from that point forward, Ashley has done very well. 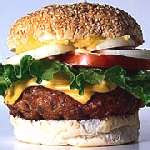 Over the years, she’s made her way through soft foods like yogurt and potatoes, then onto blenderized food – things like beans and ham spread mixed together – and finally to food with some texture to it. She is now eating a variety of different foods including some meat. She could probably use a few more vegetables and fruit, but I keep reminding myself that she still is a kid first and foremost. So, when my oldest son suggested going to lunch yesterday at a Mexican restaurant and taking Ashley, I had my doubts. I packed up her backpack with her favorite Campbell’s Soup At Hand, mac and cheese, and lots of crackers and cheese, convinced that eating Mexican food was not in Ashley’s plan for lunch. But much to my surprise, she not only ate it, she ate a lot of it – quesadillas, enchiladas, nacho chips, and very spicy cheese dip. We even had to ask the waiter for extra food because she was making her way through the initial order so quickly. Do you see now why it is a miracle? This child of mine who didn’t eat anything for the first several years of her life – this child who has spent years of her life in feeding therapy – this child who is deafblind and hates new textures – willingly and with gusto enjoyed a cultural lunch yesterday! My son was so excited that he even paid for everyone’s lunch!! I mentioned in my Thankful Thursday post yesterday that Ashley has a new intervener at school. Also known as a one-to-one instructional assistant, Mary Beth will be Ashley’s eyes and ears during the school day. The transition from Amy, the previous intervener, to Mary Beth, was handled extremely well by my school district. Amy remains in the same classroom as the “classroom instructional assistant”. That means she will be around as Ashley adjusts to Mary Beth, and if Mary Beth has any questions, Amy is always available to answer them. For once, Ashley did not have a support person just disappear one day to be replaced by someone new the next – a situation that happens often to our children with significant disabilities. Preparing our children with significant disabilities for these transitions can be a difficult task, especially when the transition occurs quickly. How do you explain to a young child who lives more in a concrete frame of mind that one of the special people in their life is moving on? How do you explain that someone new will be taking over? How do you help your child develop a positive relationship with the new support person when they have a tough time understanding where the old support person went? What about family and friends that move away, especially if the distance is so great that seeing the departing person will happen very infrequently if at all? And, how will I explain to Ashley when her beloved brother, Chip, goes off to college? I can’t think of a picture symbol that would explain those concepts. Often, for typically developing children, letters and phone calls can be exchanged after a transition. Parents of typically developing children may struggle with explaining the transition, but words can usually be found. What happens to the child who can’t hear the words or can’t understand the words? It’s obvious from this post that I have more questions than answers. If any of my readers have suggestions or just wish to share their experiences with transitions, I would love to hear what you have to say. for Ashley's new school intervener and BFF, Mary Beth! for my beautiful blooming camellia and forsythia bushes. Mother Nature has begun her Spring show. for cilantro. I just discovered its unique flavor about a year ago, and it is now my favorite herb. for days, like today, when I make it all the way to work without having to stop for one red light. for the Biore face cleansing cloths my friend, Lynnette, recommended for Ashley. They have a wonderful fresh scent and work so much better than the eye-burning soap on a washcloth method. One year later. 4’5” tall. 63 pounds. Growth has stopped. "Ashley did not grow in height or weight in the last year, she will always be flat-chested, and she will never suffer any menstrual pain, cramps or bleeding," say her parents. That’s because she had a hysterectomy, her breast buds removed, and will take drugs for the rest of her life to keep her from growing. Her growth plates are permanently closed, and all this treatment has taken about a foot off her anticipated height. Ashley X. is 10 years old. According to her parents, Ashley’s current state is a definition of success. Success for whom I am compelled to ask. The CNN interview reports when Ashley was 6, her parents approached Children's Hospital and Regional Medical Center in Seattle, Washington, for the operations. They believed this would make it easier to cuddle and carry a child who can do little more than lie propped on a pillow. Yet another compelling questions pops into my mind – so this surgery was done at least in part to make life easier for the parents. Eh? The endocrinologist who participated in the treatment has committed suicide. The parents say it’s because he was so committed to helping other families the way he “helped” theirs, but he was thwarted by the law and opponents to the treatment. Ashley’s parents remain convinced that what they did was the most loving choice they could have made for their daughter. Ethicists believe that the "Ashley treatment" is a violation of not only human dignity, but also of a physician's oath to do no harm. How do I feel? Well, here are links to previous blogs I have written about Ashley X. My feelings have not changed. I am outraged and appalled by what these parents did. Here also is a link to the CNN story and to the interview with the parents. I like to believe that children end up in the families in which God destined them to be. I know it isn’t always true given the stories of abuse and neglect, but I hope that it is mostly true. One of my favorite movies when I was a child was very old, in black and white – I don’t know its name – and it told the story of children waiting in Heaven for their particular family. The children in movie Heaven were usually around 5-7 years old, but when it came time for them to join their appointed family, they went as babies. I get warm fuzzy feelings inside thinking that all my children were waiting in Heaven to join me at the time ordained. And those warm fuzzies get even warmer and fuzzier when I spend afternoons like I did yesterday around children who were not waiting in Heaven for me. When Amy and I took Ashley to her neurologist appointment late yesterday afternoon, we walked into a very crowded waiting room. Since we arrived about 5 minutes before our 4:15 pm appointment time, I realized that we were going to be waiting quite a while. Anticipating a long wait, I had packed a backpack with enough stuff to keep Ashley amused for a while. Apparently the other mothers in that waiting room didn’t think about that. Two brothers, one about 6 years old and the other maybe 3 years old, were both very social, social to the point of annoying. Both couldn’t wait until we were through the door to come rushing up to Ashley. The looked her over, and then looked some more. The youngest took the handles of her wheelchair and wanted to play with her chair. That same child then tried to open Ashley’s backpack to see what was inside. The oldest kept asking questions – “Why is her eye like that?”, “What’s wrong with her?” (always one of my favorite questions…). I decided that since we might be sharing the waiting room for a while that I wouldn’t be rude and tell the obnoxious little creatures to leave us alone. I was hoping their mother would take over at some point, but all she did was say ,”Get your butts back over here” without taking her eyes off the magazine she was reading. Needless to say, their butts didn’t go anywhere. Just as I thought I would be spending the next hour or so trying to ignore them, in walked another family that was impossible to ignore. A mom and her young son approached the waiting room. I knew they were approaching even though the door was shut because the child was emitting loud, piercing screams. It was like an ambulance pulling up behind your car – the sounds keeps getting louder and louder as the ambulance approaches. Once in the waiting room, the screams persisted punctuated only by the boy throwing himself face first to the floor for about 5 seconds before jumping up again and resuming his screaming. Interspersed with the screams was some very colorful language – language that in my family gets a mouth washed with soap. Although it was hard to pinpoint the boy’s age, he was not an infant or even a toddler. Once or twice when the screams stopped, he was capable of carrying on a conversation with his mother. The mother took him to the bathroom at one point, his screams echoing down the hall, and the doctor’s receptionist looked at the rest of us in the waiting room and said, “I don’t think I will ever have children.” As they returned from the bathroom, the siren screams increasing with each step closer, we were finally called back to see the doctor. I told the neurologist that I was so very glad to see him and I meant it with every cell in my body. I think he understood why. So, thank you God for sending Chip, Ashley, Corey and Jessica to me. And thank you for sending the other children in the waiting room to their parents. p.s. 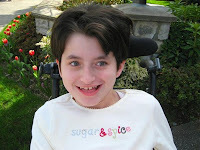 Check out the interview that Michele at the Special Needs Parent blog did with me. "The injuries we do and those we suffer are seldom weighed in the same scales." TV, radio, and print media have been full of stories about the worsening economic crisis. Most of the stories focus on the housing market, and how high the number of foreclosures are. I believe there are many other stories in the U.S. that reflect the effects of our poor economy, but those stories don’t often get coverage. I heard on a local radio station this morning that huge numbers of children are entering the foster care system in the southwestern part of my state. Why? Because their parents are manufacturing and selling methamphetamine to try to make their house payments. Always an area of lower economic means and high meth use, the fact that things are getting much, much worse is very telling for this part of the state. The economic crisis can now be held responsible for increased meth production and addiction and for the dissolution of families, as well as for loss of homes. Another sign, at least to me, as to how bad things are getting, is the increased numbers of people I see shopping at Goodwill and other second-hand stores. My oldest son and I make frequent trips to our local Goodwill store in search of music for his record player. Being the free spirit that he is, Chip would prefer to listen to old 33 1/3 vinyl records than to compact disks. He claims the music is ‘richer’ on the vinyl. Until the last 6 months, whenever we were in the Goodwill store, which was usually on a Saturday, not many other people were shopping there. That is no longer the case. When we visited last week and yesterday, the parking lot was full, the store was crowded, and the check-out lines were as long as any line in a WalMart. Entire families were shopping together, gathering clothes, toys and housewares. Being forced to shop at Goodwill rather than a deep discount store such as Walmart is also very telling of the current state of the US economy. The final, and most heartbreaking, sign of how bad things have gotten was revealed in the faces of the homeless family I passed yesterday afternoon. The family was composed of a man and a woman, and three children, the oldest of which was in a wheelchair. They were all carrying garbage bags full of what appeared to be their meager belongings, and bags were also tied onto the wheelchair handles. 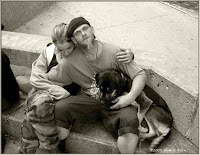 I see lots of homeless people in our downtown area, most of them, however, are men or women alone, wandering the downtown streets of the city in which I live. This was an entire family, and they were walking the sidewalks of the suburbs, about 15 miles from downtown. Their utter despair was as evident in their slow, burden-heavy pace as it was on their downcast faces. The next statements I write will be political in nature. If you do not want to hear about my political views, I suggest you stop reading now. Our economy has been plummeting the entire time that the Republicans have been in the driving seat of this country. Young men have died in record numbers in Iraq – families have lost their life savings and the security they had planned for their retirement years. Legions of families with young children are suffering and the outlook continues to worsen. Might it be time for a different driver? As a parent of a child with epilepsy, I have heard many times that watching television can trigger a seizure. Up until about a year ago, Ashley was never really interested in television, but she now knows when her favorite shows come on and will request to watch them. Because of this newfound interest, I have been a little concerned about her seizures. I don’t believe watching TV has ever triggered one of her seizures, but I still worry. So, when I saw a news article about a music video by Gnarls Barkley being blocked from play by MTV for the very reason that it could trigger a seizure, I decided to do a little research. According to the article about Gnarls Barkley, the music video failed the ‘Harding Test’, a test of television seizure guidelines. Graham Harding, pictured above, is an authority on photosensitive epilepsy. He developed the Harding flash and pattern analyser, which the Independent Television Commission adopted in 1994 and which is still the standard test to guard against epilepsy-inducing scenes. So, does this newfound information make me feel better or worse about Ashley’s interest in TV? I’m not sure. But, it will make me more observant, especially because PSE often begins around the time of puberty. Now I need to find out if PSE results in specific types of seizures so I will know what to look for while observing Ashley. If any of my readers have additional information, please share!! 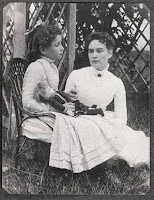 Experts on Keller's life believe it could be the earliest photo of the two women together and the only one showing the blind and deaf child with a doll — the first word Sullivan spelled for Keller after they met in 1887. One of the greatest things about my 17 year old son, Chip, is that he likes to share his world with me. Unlike a lot of teenagers, including my 15 year old son, Chip is not the moody, reclusive type of kid who seems to prefer the company of his friends at all times instead of time with his family. Chip does have his friends, friends who enjoy the same things he does – music, computers, and rockclimbing – but he seems equally as comfortable spending an evening with me and his siblings. Last night, for example, he really wanted me to watch a movie with him, a documentary titled “The Devil and Daniel Johnston”. Daniel Johnston is an American singer, songwriter, musician and artist. He also is diagnosed with bipolar disorder and autism. According to Wikipedia, “His songs are often called "painfully direct," and tend to display a blend of childlike naïveté with darker, "spooky" themes. Johnston's earliest recordings present him singing in a high register. However, throughout the nineties his voice acquired a new character and tone and an altogether different style of delivery and diction. This may have been inspired by a mixture of the damage done by smoking, tooth loss and medication prescribed to control his disorder. His performances often seem faltering or uncertain; one critic writes that Johnston's recordings range from "spotty to brilliant”. And, his music has been acclaimed by David Bowie, Yo La Tengo, Sonic Youth, Eddie Vedder, Beck, Spiritualized, The Flaming Lips, Justin Furstenfeld, Bright Eyes, and Matt Groening. Kurt Cobain praised Johnston's work, and often wore a tee shirt featuring the cover art of Johnston's debut release, "Hi How Are You?" The frequency with which Cobain wore the "Hi How Are You?" tee shirt exposed Johnston to an even wider group of music enthusiasts. I must admit, I don’t get the attraction to his music, and while the documentary was interesting and I hear, was hailed at the Sundance Film Festival, I didn’t view it as a major work of art. However, what was extremely important to me was Chip’s excitement at learning about Daniel Johnston and his acclaim despite a significant disability. Chip even asked if we could have Mr. Johnston perform at one of our support group family retreats. I know I’ve written many times in the past about what a special kid Chip is, but his acceptance of people with disabilities, no matter how significant the disability, as a normal part of his life inspires me. Perhaps his acceptance comes from being the sibling of three people with significant disabilities, or maybe my advocacy has over time worn off on him, but whatever the reason, I believe he will be a force to be reckoned with in future years as a strong advocate himself. He gets it…he really gets it. Whenever I get sick, I start wondering what would happen to my children if I were to get really, really sick. I can get myself so worked up over those thoughts that soon I am wondering what color urn they will pick out for my ashes and who will care for Ashley. Even though I say this in a lighthearted manner, my thoughts are anything but lighthearted. I’ve been to seminars proclaiming the value of special need trust funds. I’ve seen the dire warnings about children with severe disabilities not having enough money (translation – only SSI money) to live out their lives. While those things are very real concerns of mine, the things I obsess over are smaller. For instance, who will know that the best way to get Ashley to brush her teeth is to count to 2, ask her what comes next, and then she will sign 3 and open her mouth. Who will know that she loves the smell of Japanese Cherry Blossom hand lotion from Bath and Body Works? Who will know that whispering in her ear is a sure fire way of getting her attention when she is close to a meltdown? Will anyone be able to figure out that when she turns over one of her battery operated toys she is indicating she believes the batteries need changing? When she throws her jeans across her bedroom in anger, will her new caregiver figure out that she hates the feel of denim and only wants her velour pants instead? Will they know that even though she loves macaroni and cheese and peas that she will absolutely not eat either one if they are mixed together? And, that she will only eat LeSeur Baby Peas and Yoplait Vanilla yogurt? Who will tell her new caregiver which plant leaves are ok for her to chew on and which ones are poisonous? Will they know when she signs bird when she is outside that she is actually hearing the birds sing? Since her signs for “swing” and “swim” look very similar, how will they know which she means? Will her new caregiver know to give her the light up stuffed bear at bedtime and pull the covers over her head so she can see the light better? Will they know that she loves to be told “Up and Attem, Ashley Ant” every morning when she is woken up? And who will know that her favorite color is red except when it is pink or when it is orange? Perhaps all these thoughts are just the musings of a fevered mother, or perhaps I need to start writing down everything just in case. Wait – maybe that is what I am already doing in this blog! I never paid much attention to the posters in the pediatrician's office that shared the message of antibiotic overuse. I've also seen articles in magazines on the same subject, but until recently didn't spend time reading them. However, I have begun to consider the message that doctor's seem so eager to share. Ashley has a LOT of ear infections and sinus infections - always has. One of the results of her birthmother's alcohol use while pregnant is Ashley's diagnosis of fetal alcohol syndrome (FAS). And one of the features of her FAS is ears that are not normally formed internally. While many kids outgrow the ear infection stage by the time their eustachian tubes become more vertical rather than horizontal, Ashley's ears haven't followed that same progression. Throw into that mix several tumors she has had in her ears over the years, and ear infections become a lifetime issue. Even the slightest cold can turn into an ear infection, and infections require antibiotics. That path has led us to many different antibiotics, getting stronger and stronger ones, and instead of a typical 7 day course of the medication, 21 days is not usual for Ashley. But now, even the 21 days do not appear to be enough. Last week, after failing three back to back courses of different oral antibiotics, the only choice left to battle Ashley's double ear infections was antibiotic shots. Last Thursday, she received three shots, Friday the same thing, and Saturday, the last three - nine shots in three days. Will that be enough to take care of the current ear infections? We won't find out until her recheck appointment at the end of this week, but even if this solution worked this time, does it mean Ashley's future holds more and more antibiotic shots? While Ashley's case is not one of antibiotic overuse, she is a clear illustration of what can happen when antibiotics are used over and over again in short periods of time. If you have a child with an ear infection, and your doctor wants to wait a while before trying antibiotics, I would suggest giving it a try. If the pain is more than your little one can handle, the doctor can prescribe numbing drops to help. I would just hate to think of children having to endure what Ashley endured last week.